In 1984, the City of Pointe-Claire created the Aid for Seniors program providing seniors with household chores and outdoor maintenance work carried out free of charge by students. This program enables low-income seniors to remain in their homes longer, helps break their isolation, and promotes involvement in the community, employment for young people, and inter-generational connections. In the first year, five students were involved with 100 seniors. The offering was gradually expanded to provide a continually better response to the needs of the growing seniors population. Today, 34 regular and part-time employees, 20 volunteers, and a number of interns carry out activities for over 18 programs, events and services provided to 3,259 recipients.A strong, diversified network was also introduced into the program, which has become the hub for a range of services provided by the Quebec government’s social, health and security services and many community organizations.Over the years, the connections between the young people and the seniors have developed to the point of becoming an integral part of their daily routine, over and above the program’s established parameters.The process helps breaks the isolation that seniors often face while exposing young people to seniors’ wealth of knowledge, wisdom and experience. Young people are also in a better position to understand seniors’ vulnerability and frailness and sometimes the uncertainty of their personal situation. Although the initial aim of the program was to help seniors stay at home, the friendships that developed, in both directions, have created a real way of life incorporated into the daily routine of young and old alike.The activities, support measures, services and initiatives that bring Pointe-Claire’s young people and seniors together are a wonderful example of community spirit today. Details on older people's involvement: Wisdom is passed along to young people as seniors, over the years, become their mentors. The seniors share life experiences, memorable encounters, surprising stories and even some of their well-kept secrets. All of this stimulates the young people, expands their horizons, encourages them to dream, and helps them understand history and the important role that our seniors have played in society. The process helps breaks the isolation that seniors often face while exposing young people to seniors’ wealth of knowledge, wisdom and experience. Young people are also in a better position to understand seniors’ vulnerability and frailness and sometimes the uncertainty of their personal situation. 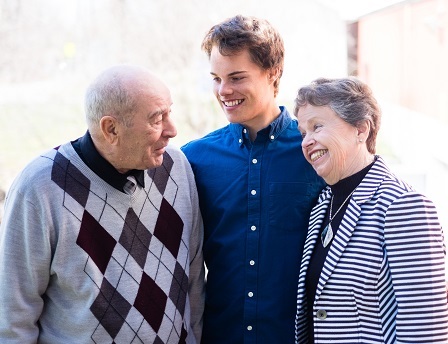 Over the years, we have seen relationships develop between young people and seniors and become an integral part of their daily routine, beyond the program’s established parameters. This program is unique and original because the community developed it and transformed it into a true way of life incorporated into the daily routine of young and old alike. The process helps breaks the isolation that seniors often face while exposing young people to seniors’ wealth of knowledge, wisdom and experience. Young people are also in a better position to understand seniors’ vulnerability and frailness and sometimes the uncertainty of their personal situation.Although the initial aim of the program was to help seniors stay at home through support for household chores and outdoor maintenance work, the two-way friendships that young people and seniors developed have created a way of life that goes well beyond the requirements of an assistance program. The activities, support measures, services and initiatives that bring Pointe-Claire’s young people and seniors together are a wonderful example of community spirit today.In the first year, five students were hired for the summer to address the needs of 100 seniors enrolled in the program. Due to the program’s success, the offering was expanded to provide a continually better response to the needs of the growing senior population. Today, over 18 programs, events and services are provided to 3,259 recipients. The organization has a dedicated, respectful and well-informed team of 34 part-time young people, 9 employees, 20 volunteers, and many interns. It is the young people’s personal commitment that defines and characterizes the program and makes it outstanding. The program has developed over the years, and activities have been added in order to better respond to the needs of a growing population of seniors. Development of the Aid for Seniors Program reflects the social commitment that everyone – citizens, young people and seniors – has developed and expanded, and now values. These improvements happen naturally thanks to open ongoing communication between our teams, our seniors, and our partners.The attention paid by one group to the needs of the other has allowed the program to be deployed through the public and community networks. Initiatives are interconnected and inter-related, and isolated action is eliminated. At this point, the connections it provides are solid enough that educational institutions at the high school, college and university levels, as well as other public and community agencies, use the program as a way to reach Pointe-Claire seniors. Police officers, ambulance attendants, public safety patrol officers, firefighters, social service officers and nurses all use the platform provided by the program, which makes it easier for them to act and ensures greater impact. For issues such as hygiene, salubrity, nutrition, safety, prevention or intervention, the program’s intergenerational community has become the normal environment in which they operate.This reality promotes a more tolerant, inclusive and cooperative society in which mutual assistance has become a lifestyle and friendships between people of different generations are normal. The result is true community spirit and genuine compassion. Thanks to this closeness to the community, we are better placed to assess services on an ongoing basis and to keep on improving our response to the community’s needs.On a regular basis, program managers visit seniors or speak with them by telephone to make sure they are fully satisfied with the services they receive.According to a recent survey among a representative sample of 50 randomly selected senior clients enrolled in the Aid for Seniors program, 96% of participants are satisfied or very satisfied with the general cleaning services provided in their homes, 98% are very satisfied with the overall service offering, and 98% indicate that they are satisfied or very satisfied with the follow-up. Ninety-two per cent would recommend the Aid for Seniors program to others. Through ongoing surveys and feedback gathered by telephone calls and home visits, we are able to compile feedback and gather information on clients’ needs on a regular basis. We often receive positive feedback and comments of appreciation from our clients for the services we offer.Relationships with our clients have made them part of our Aid for Seniors family through the years. Our community partners often express their appreciation for our social and home support initiatives for all Pointe-Claire seniors. The Aid for Seniors program was awarded a Social Development Award by the Union des municipalités du Québec in May of 2016 for our innovative approach and intergenerational initiatives. The relationships that are created between young people and seniors are very encouraging in today’s society. Our program has been in existence for 32 years and the program is still growing and that we can be a part of seniors’ daily lives within the community. The Aid for Seniors program is systematically enhanced and improved. In 1984, when the program was first created, students went to people’s homes to do household chores and outdoor maintenance work. The offering has been expanded over the years to better address the needs of the growing population of seniors. The program has undergone considerable development over the past 10 years with the creation of the day centre for seniors. The centre provides additional services such as the friendly phone call program, activity days, walking and exercise groups, assistance in moving recycling bins, and customized transportation. Events have also been added to the annual calendar (spring luncheon, strawberry festival, community bingo, holiday luncheon, community bean lunch, National Seniors Day). Thirty-two years ago, 100 seniors were enrolled. In 2015, 3,259 recipients participated in over 18 programs and events. Since the beginning of 2016, five programs and activities have been added to regular services. Two main issues have been identified over the years: the students’ limited knowledge of how to deal with an emergency situation and the challenges in reaching the City’s senior population. For over ten years, all students hired by the program have received training in first aid and cardiopulmonary resuscitation. They can identify the signs and symptoms of an emergency situation and more importantly, they know how to respond promptly and effectively. It is also possible to follow up as needed with a senior’s family to inform them of a particular medical situation as well as try to be proactive in senior citizens’ lives. We provide training and support to all of our students on an ongoing basis for prevention and security when working with seniors in the community. Various lectures are offered to seniors on topics such as health, home safety and security, promotion of fitness and social programs, and various activities and crafts. A second challenge is to reach all Pointe-Claire seniors, particularly in an emergency situation. Phone lists are currently limited to seniors enrolled in the Aid for Seniors program. To correct this situation, our team works to update and expand the reference phone directory on an ongoing basis to be able to contact seniors when needed. During a major heat wave or power outage, for instance, students in the Aid for Seniors program phone all the seniors enrolled in the program to make sure they are taking necessary precautions and have everything they need on hand. One of the main challenges encountered by managers over the past few years is the trust relationship between our younger generation and seniors. When seniors first make contact with the Aid for Seniors program, they are often worried about letting an unknown student into their homes to do household chores or yard work. To help the trust relationship develop quickly, managers accompany young people during the first visit. In most cases, a sense of trust is then established right away. Again with a view to maintaining and improving trust, young people are matched with the same seniors for the length of their contract: this too helps develop intergenerational bonds. The senior/student pairing is always preceded by an assessment of the seniors’ personalities and character traits through a phone interview in order to match people who are naturally compatible and have some things in common. Another challenge involves properly connecting seniors with particular needs (for example medical and social needs) that require additional assistance or expertise. Throughout the years, we have established an all-encompassing network of partners that enables us to promptly refer seniors to the appropriate organizations and community programs.Transportation can be an ongoing challenge for all seniors who are required to use public transportation in order to do errands or go to appointments. The Société de transport de Montréal (Montreal’s mass transit authority) created a Navette Or by Taxi program which has benefited the senior residents of Pointe-Claire for the past few years. This program offers 32 local stops for seniors registered with the program. This collaboration between the STM and Pointe-Claire has been a very successful program so far. We have been able to address these issues thanks to support within the City and the participation of many partners within the Pointe- Claire community.